Sharing a home for the first time can be both exciting and scary. Decorating a home together, whether for the first or the fifth time, is often challenging unless there is compromise, a little give and take in the decision making process. Whether you are moving into your partners home, vice versa or buying a home together it often takes a balancing act to accommodate your differing tastes; your partner may like a minimal contemporary look, whereas you feel more at home with a softer more luxurious style. What can you do to blend the two together? This is a very common problem, and one that can seem quite challenging. There are, however a few very simple ways that you can tackle this issue with great success, starting with identifying the common ground between your tastes. A good starting point would be for you both to visit a department store such as John Lewis, as they have a good selection of furniture and fabrics to review within every store. This also ensures you are both involved in the process together, which is very important. As you browse the furniture floor or fabrics department remember to explain to your partner why you like something as well as why you don’t. There is ALWAYS a cross over point where an item can fall into either categories and both can be happy with the choices you make. To ensure that your design looks well thought out and incorporates both styles, an easy solution would be to choose light coloured painted walls and plain, contemporary style furniture. This can then be softened with the use of texture, pattern and colour in fabrics and accessories to introduce the softer feel. 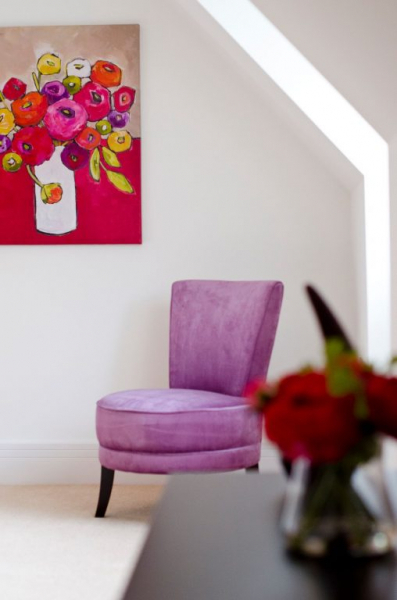 Keeping the larger percentages of the room in plain, light colours means you can add more vibrancy into the fabric choices and not be in danger of the room looking crowded or confusing. This look is also more in keeping with a contemporary scheme, which will ensure your partner’s style is satisfied. When picking fabrics there are some wonderful abstract pattern, floral, geometric designs out there that can fall into both the contemporary as well as more traditional, softer style, which would work well when used with contemporary furniture. This is where you can add some fun and inject your style to the space with great results. Ultimately compromise has to happen to some degree in any situation such as this, but there is no reason why both your styles cannot sit well together. By working through the suggestions above you should end up with a room you both enjoy in equal measure.